Tech Tip #25 showed how to configure WildFly on Raspberry Pi. Tech Tip #27 showed how to setup WildFly on two Raspberry Pis in managed domain mode. This tech tip will show how to setup a WildFly cluster over those two hosts. Need to get 1,352 kB of archives. After this operation, 4,916 kB of additional disk space will be used. This file will be picked up via a direcinve in “/etc/apache2/apache2.conf”. If there are any errors, then you can see them in “/var/log/apache2/error.log” directory. The newly loaded modules are highlighted in bold. This is enabled by editing “/etc/hostname” on each Raspberry Pi and changing “raspberrypi” to the given name. Here <IP Address> and <Host Name> for each host needs to be used from the table above. This ensures that any cookies are set from the same domain. This directive provide load balancing between “master” and “slave”. “Header” and “ProxySet” directive provides sticky session. And so in three parts (part 1 and part 2), we learned how to setup a WildFly cluster on Raspberry Pi! Tech Tip #25 showed how to configure WildFly on Raspberry Pi. This tech tip will show how to setup a WildFly managed domain over two hosts running on Raspberry Pi. Lets understand some basic concepts first. Multiple standalone instances can be configured to form a highly available cluster. It is up to the user to coordinate management across multiple servers though. Servers running in managed domain mode are referred to as the members of a “domain”. A single Domain Controller acts as the central management control point for the domain. A domain can span multiple physical or virtual hosts, with all WildFly instances on a given host under the control of a Host Controller process. One Host Controller instance is configured to act as the Domain Controller. The Host Controller on each host interacts with the Domain Controller to control the lifecycle of the application server instances running on its host and to assist the Domain Controller in managing them. It is important to understand that administration of servers (standalone or managed domain) is orthogonal to clustering and high availability. In the managed domain mode, a server instance always belong to a Server Group. A domain can have multiple Server Groups. Each group can be configured with different profiles and deployments. “main-server-group” has two servers: “server-one” and “server-two”. “other-server-group” has one server: “server-three”. By default, these are all configured on a single machine (localhost) with Host Controller and Domain Controller co-located. This is defined in “domain/configuration/host.xml”. Each Server Group is configured with a profile. These profiles are defined, and associated with a Server Group, in “domain/configuration/domain.xml”. Default WildFly installation comes with two profiles: “full” and “full-ha”. “main-server-group” is configured with “full” profile and “other-server-group” is configured with “full-ha” profile. Profile is a named set of subsystem configurations that adds capabilities like Servlet, EJB, JPA, JTA, etc. The “full-ha” profile also enable all subsystems needed to establish cluster (infinispan, jcluster, and mod_cluster). OK, enough explanation, lets get into action! Make sure to install WildFly on each of the Raspberry Pi following Tech Tip #25.
docs.jboss.org/author/display/WFLY8/WildFly+8+Cluster+Howto explain in detail on how to setup Domain Controller and Host Controller on two hosts and enable clustering. This tech tip follows these instructions and adapt them for WildFly. This tech tip will show how to configure WildFly managed domain over two Raspberry Pis. A subsequent blog will show how to configure cluster over this managed domain. Call one host as “master” and another as “slave”. Deploy a project into domain, and verify that the application is deployed on both master and slave hosts. Scroll down to the SSH option and enable it. Then the two Raspberry Pis were configured to run in headless mode (no keyboard, mouse, or monitor). The default password is “raspberry”. and remove the lines marked 80 through 110. 10.0.0.27 is master’s IP address. Edit “domain.sh” and remove the lines as done for server. This will ensure that non-server, or client, JVM is used for running the domain. Remove “-server” option by removing lines 75 through 77 as explained above. 10.0.0.28 is slave’s IP address. Using “add-user.sh” script, create a user in Management Realm for master. </strong>Password recommendations are listed below. To modify these restrictions edit the add-user.properties configuration file. </strong>JBAS015269: Password must have at least 8 characters! Using “add-user.sh” script, create a user in Management Realm for slave. The username must be equal to the name given in the slave’s <host> element in “host.xml”. The answer to the last question is “yes” as this slave will be connecting to master. Note that output’s last line contains a <secret …> element. Copy this string as this will need to be used in slave’s “host.xml”. The <secret …> element added here is obtained when “add-user.sh” is invoked for slave in the previous step. Slave’s host name is “slave”, master has a username by “slave”, and adding <secret …> element (base64 code for the password) allows the slave to connect to master. Make this change in “domain/configuration/domain.xml” for slave as well. Disable the firewall on master and slave by giving the following command on each host. [Host Controller] 17:33:31,545 INFO [org.jboss.as.domain] (Host Controller Service Threads - 56) JBAS010918: Registered remote slave host "slave", WildFly 8.1.0.CR2 "Kenny"
Check out a simple application that puts/gets some HTTP session data. This will generate a WAR file in the “target” directory. [Server:server-three] 20:20:31,475 INFO [org.jboss.as.server.deployment] (MSC service thread 1-2) JBAS015876: Starting deployment of "http-1.0-SNAPSHOT.war" (runtime-name: "http-1.0-SNAPSHOT.war") [Server:server-three] 20:20:35,690 INFO [org.infinispan.configuration.cache.EvictionConfigurationBuilder] (ServerService Thread Pool -- 70) ISPN000152: Passivation configured without an eviction policy being selected. Only manually evicted entities will be passivated. . . . [Server:server-three] 20:20:41,028 INFO [org.jboss.as.clustering.infinispan] (ServerService Thread Pool -- 71) JBAS010281: Started default-host/http-1.0-SNAPSHOT cache from web container [Server:server-three] 20:20:41,214 INFO [org.wildfly.extension.undertow] (MSC service thread 1-1) JBAS017534: Registered web context: /http-1.0-SNAPSHOT [Server:server-three] 20:20:42,472 INFO [org.jboss.as.server] (ServerService Thread Pool -- 69) JBAS018559: Deployed "http-1.0-SNAPSHOT.war" (runtime-name : "http-1.0-SNAPSHOT.war"
[Server:server-three] 20:20:35,690 INFO [org.infinispan.configuration.cache.EvictionConfigurationBuilder] (ServerService Thread Pool -- 70) ISPN000152: Passivation configured without an eviction policy being selected. Only manually evicted entities will be passivated. [Server:server-three] 20:20:42,472 INFO [org.jboss.as.server] (ServerService Thread Pool -- 69) JBAS018559: Deployed "http-1.0-SNAPSHOT.war" (runtime-name : "http-1.0-SNAPSHOT.war"
So we could easily deploy a Java EE application to multiple WildFly instances, running on RaspberryPi, in managed domain mode, with a single command. How cool ? Next blog will explain how to setup cluster on these multiple instances. This is the third part (part 1, part 2) of a multi-part video series where Lincoln Baxter (@lincolnthree) and I are interactively building a Forge addon to add Java EE 7 Batch functionality. As earlier, the evolving source code is available at github.com/javaee-samples/forge-addons. The source code is compiling fine but not serving the intended purpose yet. It will be further debugged in the next episode, coming later this week. A JBoss User Group (JBUG) is a group of people who share a common interest in JBoss technologies. They are organized and supported by the community and meet on a regular basis to discuss new technologies, development methodologies, interesting use cases, and other technical topics. The common goal is to provide education, help, and social events for the community and to promote open source. There are several JBUGs around the world and you can always start a new one in your local community. JBUG Worldwide is like any other JBUG but the events will mostly take place virtually, using a Google Hangout. This allows us to reach to a broader set of audience, the presentations are recorded, and available for replay on the youtube channel. To our audience, it provides access to world-class speakers from Red Hat and rest of the JBoss community, which otherwise may not be easily accessible. This effort is initiated by JBUG Newcastle and so sometimes the meeting may coincide with a physical meeting at that JBUG. You may find stark similarity with vJUG, and that is indeed true! However vJUG will continue to focus on broader Java topics and may feature some widely used JBoss technologies. But JBUG Worldwide will cover a wider range of JBoss technologies, and some of the niche ones as well. We would love hear to your feedback about speaker/topics, streamlining the process, or any thing else. We need you to make this successful! Ping @Pfrobinson or myself (@arungupta) for any questions/comments. WildFly is a lightweight, extremely flexible, highly manageable, Java EE 7 compliant, open source Application Server. Raspberry Pi (a.k.a. Raspi) is a credit-card sized computer that plugs into a computer monitor or TV, and uses a standard USB keyboard and mouse. It was created with the intention of promoting teaching of basic computer science in schools. This tech tip will show how you can get WildFly running on Raspberry Pi. Raspi does not come with a storage device, not even for the operating system. But there is a slot for SD card that can be used for booting and persistent storage. So, what else do you need to get going ? The original intention of Raspi was to promote teaching of basic computer science in schools. But people have all sorts of fun things with Raspi, including a super computer. Easiest way to get started with Raspi is using New Out Of The Box Software (NOOBS). on SD card. The installation instructions are clearly documented here. Insert the prepared SD card, plugin the dongles and cables as shown. Make sure that the cable to laptop is connected after all others have been connected. Clicking on “Yes” will start the Raspbian installation. What crazy thing are you going to use WildFly and Raspberry Pi for now ? Zero Turnaround (the company behind JRebel and other Java productivity tools) has released their fifth edition of Java Tools and Technologies Landscape. This report started in 2009 as the speed of Java application server restarts, and has evolved into a lot more comprehensive report over the past 5 years. Oliver White (@theotown) and rest of Rebel Labs have really invested a lot of effort in making it a comprehensive and an inclusive report. Several Red Hat projects/products are being mentioned in this report ranging from JBoss/WildFly, Hibernate, Ceylon, JBoss Developer Studio/Eclipse, Arquillian, and others. 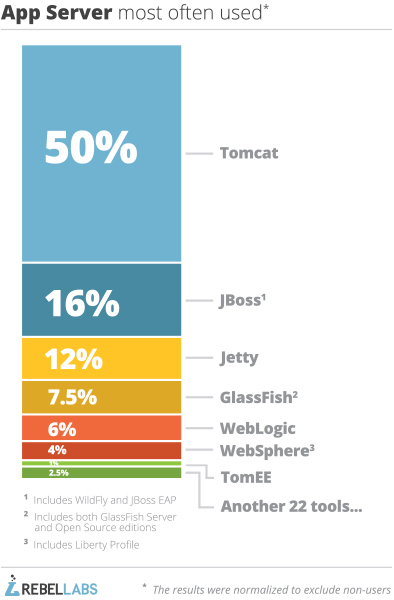 84% of respondents are using Java EE 6 or Java EE 7. If you need a Java EE 6 commercially supported application server, then get started with JBoss EAP. If you need a Java EE 7 compliant application server that will be commercially supported, get started with WildFly. Download the complete report here! Configuration JSR in Java EE 8 – What should be covered ? GeeCON 2014 was very inspiring! A really greet feeling from the Polish Java community, awesome bunch of organizers (Andrej (@ags313), Adam (@maneo), Konrad (ktosopl), Adrian (@adrno), rest of the gang is just super nice), great technical content, courteous and helpful volunteers, lots of socializing space/opportunities, and most importantly fun! This was my second GeeCON and would love to go back there next year. During speakers’ dinner, Anatole (@atsticks) and I were talking about the Configuration JSR (scheduled to be part of Java EE 8) and he shared the proposal. Instead of reading the proposal, I decided to put my thoughts down first so as not to be tainted by it. So this blog describe the use cases that I think this JSR should address. This by no means is a comprehensive list, or in any particular priority order. It is solely intended as input to the JSR and Expert Group based upon Anatole’s request, Laird Nelson (@chuggid) is the other spec lead on this. Application-wide configuration may be provided using XML-based configuration (application.xml ? ), Annotations, and a programmatic Java API. A graphical web-based tool may simplify generation of these artifacts as well. In addition, a mechanism to trigger a particular stage would need to be defined. An external configuration tool that can trigger a particular environment may be one way to achieve this. Relying upon environment variables does is not a good idea. Custom stages should be permitted as this would allow to target different environments for stress, performance, regression, integration, and different sorts of testing. All of this, of course, would work for Java EE components only. Configuration may not be restricted to only Java EE components. It may include the max amount of memory that the application could use on the server, whether high availability is enabled or not, min/max number of servers in a cluster, etc. This would require to specify the configuration outside of Java EE context. Stages may inherit from other stages. This would allow a production environment to point to the test database rather easily. In this case, inheritance rules would need to be defined. Application configuration may be specified exclusively outside the application. This could be done using the graphical tool, and stored in a persistent store. This would allow a system administrator to easily pick a particular configuration. Reasonable defaults should be defined for the entire application, such as more logging/debugging during development stage. This will allow containers to spit out more detailed and useful information during different stages. For example, JSF displays an error message on XHTML page, even if there is no place holder for it, during development phase but hides it during the production stage. A mechanism to store all the configuration information in a variety of persistent stores would be useful. One of the common ways could be “application.xml” as a file, typically bundled in the archive itself. Storing this information in a relational database could be useful as well. This would allow developers to focus on application configuration during development, possibly using annotations or “application.xml”. And then retrieve a testing/production configuration from a database when targeting those stages. An archive would typically have a “persistence.xml” and a “web.xml”. Explicit rules on how the values defined in those individual files are overridden by application-wide configuration needs to be defined. These rules would need to be defined amongst the different ways configuration is enabled, for example “application.xml” overriding the values set by annotations. Going a step further, it may be relevant to even provide a standard schema on how this information is persisted. Vendors may provide their extensions to it, but at least a basic schema would ensure some level of portability.A development database bundled with the application server would work during development stage. But typically a more enterprise and reliable database would be used during production. So one more step further, a standard way to connect to these databases would be useful. The scope of how/where an annotation is defined needs to be clearly specified. Whether “application.xml” can be defined in a JAR file bundled in WEB-INF/lib in an EAR file ? If so, what are the overriding rules ? Can it only be specified on the top-level archive ? What happens if there is a conflict ? JSR 236 did not specify how different managed objects can be configured, and this is a gap in the existing specification. If JSR 236.next is not being planned or not planning to address it during Java EE 8 timeframe, then this JSR should attempt to address that. Different application servers have their own means to deploy multiple versions of an application. This allows multiple versions to be deployed but only one version to be enabled at a given time. It would be nice if application versioning can be addressed by this JSR. Pre/post hooks for deployment, and other stages, should be made available. These can be used by sysadmins to provision resources required during deployment/runtime. CDI events for different stages may be generated. This would allow different parties to listen, and react to them. A Java EE 8 application may not need any deployment descriptors of the past. Bundling either just this “application.xml”, or specifying the configuration information externally should be enough. Reload of configuration information should be possible, without deploying the archive. A REST schema of all the configuration information handled by the JSR will really simplify how vendors can easily build custom tools on it. Other frameworks like Ruby-on-Rails and Grails allow application-wide configuration and we should learn from them, and adopt their best practices. There is no mention in the JSR for an XML-based deployment descriptor. Even though non-Java EE components will be specified outside the scope of Java EE, but I think having a descriptor to specify the configuration for Java EE components is useful. +1 on not defining a new archive format and Anatole has explained it well in the blog. I strongly prefer the second approach integrate this new functionality with all existing JSRs as that keeps the approach simple, and scalable to any future specs as well. This JSR should define an overall framework, and how other JSRs would specify the configuration. Individual component JSRs then should leverage that and define the exact configuration points. Ideally, each component specification should have an explicit chapter dedicated for configuration. KISSing is good and I like the proposed simplistic approach of using a Map to store all this information. What do do you think should be the scope of this JSR ? Added a calendar reminder to revisit this blog in a year, and another one in +1 year, and see how many of these points actually make it in the spec. JBoss EAP 6.3 Beta is released! This release brings continued progress on the road to making EAP the most manageable and secure Java EE 6-compliant Application Server for traditional and cloud based workloads. For current customers with active subscriptions, the Beta can be downloaded from the customer support portal and support tickets can be logged on the Beta. For community users developing applications that will be deployed on a supported EAP, the Beta can be downloaded from www.jboss.org/products/eap under development terms & conditions, and questions can be posed to the EAP Forum. Use the console and patching wizard to easily apply, rollback and view patches. Management subsystems for PicketLink IDM and Federation allowing you to create and apply security configurations for application(s) from within the container. This is more efficient and less risky than having to maintain separate xml security configuration files within each application, forcing you to redeploy those applications if any changes were made. This is the second part (part 1) of a multi-part video series where Lincoln Baxter (@lincolnthree) and I are interactively building a Forge addon to adding Java EE 7 Batch functionality. Part 1 showed how to get started with creating an addon, add relevant POM dependencies, build and install the addon using Forge shell, and add parameters to the addon. This part shows how to add some meaningful semantics to those parameters. Java EE 7 Batch define item-oriented processing where an item is read, optionally processed, and then written. Items could be read from an input source, CSV file, JMS destination, REST endpoint, database, or any other source. Similarly items can be written to an output stream, database, or some where else. This logic of reading, processing, and writing is captured in beans that are packaged in your WAR file. These beans need to either extend from a specific interface or extend an abstract class. For example item reader needs to either implement ItemReader interface or extends AbstractItemReader abstract class. Similarly item writer needs to either implement ItemWriter interface or extend <code<AbstractItemWriter abstract class. Item processor need to implement ItemProcessor interface. Part 1 showed how to add --reader, --processor, --writer parameters to the newly added batch-new-jobxml command. This part will show how to identify classes for each CLI parameter that already honor the contract required by the Batch specification. As earlier, the evolving source code is available at github.com/javaee-samples/forge-addons. The timing for the next recording is unknown at this time because of my travel schedule, but sometime next week. Want to learn all about PicketLink ? Look at deep dive sessions part 1 and part 2. Lot more information at picketlink.org. JBoss EAP (Enterprise Application Platform) is the commercially supported version of community supported JBoss AS 7.x. JBoss EAP 7 is scheduled to be released next year and will provide full compliance with Java EE 7. In the meanwhile, JBoss EAP 6.3 is getting ready to be released later this year. Download JBoss EAP 6.3 Alpha, or this is also linked from the main downloads page. Features an updated administrative console that includes a new homepage and exposes the new JBoss EAP 6.2 patching features. Also includes domain discovery and recovery improvements and support for WebSockets. A wide variety of WebSocket samples are available here. Try these samples on EAP 6.3 Alpha, and we are looking forward to your feedback. Bug #1083038 provide more details on this feature. Which WebSocket sample are you going to try ? JBoss Forge is the fastest way to build your Java EE applications, and not even tied to a particular IDE or an Application Server. Tech Tip #17 explained how to build a simple Java EE application rapidly, and deploy it on WildFly. JBoss Developer Studio provide a very neat integration with Forge as well. The instructions from the video are also explained in a text-based script here. Forge is built with an extensible architecture where third-party addons can be easily installed to enable new functionality that does not exist in the Forge itself. A large variety of addons (nee plugins) are already available such as Arquillian, RichFaces, JRebel, OpenShift, Spring, TomEE, AngularJS, Netty, and a lot more. Now, you’ve used Forge, found some functionality missing, fortunately somebody already created a addon and so could use that. But now you need some functionality and there is no addon available for that. So you’ll need to create an addon. How do you start ? We plan to record the next session next Friday-ish. Let us know if you’d like to join us on G+ hangout and will share the coordinates. The evolving source code is available at github.com/javaee-samples/forge-addons.